The Clarke Tunic in Lunar (size XS shown) is a strange beast. It's the length that falls somewhere in the no-man's land between a top and a dress. Not quite long enough to be a dress, not quite short enough on me to be a proper tunic that would look good over something else, I'm not entirely sure what to make of it. Maybe a beach cover-up, though it seems silly if you intend to use it solely for that purpose. Style Description: Oversized, short-sleeved, crew neck boxy tunic. Ended up a few inches above the knee on me, but would be mid-thigh on most. Size/Fit: Large to size. The XS was quite boxy, and the sleeves stuck out a lot in person, though it's less apparent in the photos than in real life. I would have sized down to a nonexistent XXS if possible. Overall Thoughts: This is a piece with an identity crisis, as noted above. The sleeves are too big and boxy even for a lover of boxy sleeves like me, as they overwhelm me in person even more than the photo above would suggest, especially in this rather thick textile. The multidirectional stripes keep it from being too basic, but I don't personally consider Lunar a must-have textile for this season, so this combination is not doing it for me. Have you tried the Clarke Tunic in any textiles? What do you think? Let me know in the comments or by pointing me to your post about it, and I'll be sure to link you! You might also be interested in my other reviews of Ace & Jig pieces and textiles! 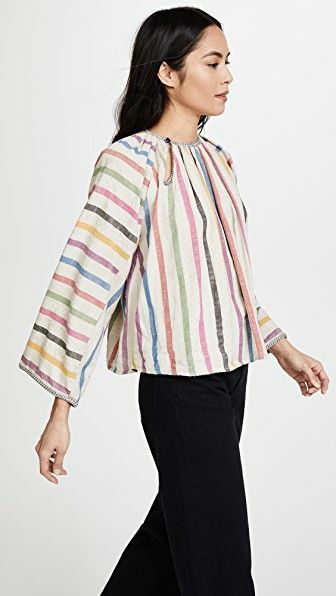 I honestly thought the Clarke Top from last season was cute... if only it weren't front/back colorblocked.